Watch the thundering waters of Shoshone Falls and canyon illuminate after dark with the shimmering power of hundreds of lasers. This year’s show will be even better than last year and designed to celebrate the Snake River and her magnificent beauty. Enjoy free family activities in the park before the show, musical entertainment and food vendors. Come see theNiagara of the West in a whole new light. Tickets are limited to 1,500 each night to ensure a great event experience. Tickets go on sale on April 1! All tickets will be available to purchase on visitsouthidaho.com on April 1st. Food vendors, family activities, music and entertainment will all be in the park leading up to the show. The event begins at 7:00 p.m. with the laser show scheduled for 10:00 p.m. Tickets cover park entry, family activities (including a kid’s zone with face painting, train rides, balloon animals, etc,) and the laser show itself. Food vendors from your favorite restaurants such as Anchor Bistro, Ketchum Burrito, Kettle-corn, Mini Donuts, and more will be set up. A few gifts and merchandise will be available for purchase. Activity booths with more information on fun things to do in the area will be set up as well. Guests are encouraged to bring blankets, strollers, flashlights and other items with them to make their time in the park enjoyable. All tickets will be emailed or mailed to ticket purchaser. Each ticket will be redeemed for wristband at check in. Wristbands are color coded and valid for a single evening entry. Tickets include entry to the park, family activities leading up to the show, and the laser show. All ticket sales are final. Reasonable requests for refunds can be requested by contacting Southern Idaho Tourism. Requests for refunds can be made by contacting [email protected] . No weather related refunds will be made. Enjoy exclusive viewing on the main platform. VIP tickets are limited to 40 people each night for optimal views. Tickets also include food vouchers for a snack and drink with one of the vendors. Tickets are full price for all ages, except for children 2 and under that can sit on a parent or guardian’s lap. Check in will begin at 6:30pm at the River Christian Fellowship Church each night before the event. Early check in days and times will be released as the event approaches. Ticket holders must have proof of ticket and ID. Proof of tickets can be shown on a mobile device or with a printed version. These will be scanned and replaced with colored. Check in will move to Pillar Falls Elementary once overflow parking is needed. Wristbands must be worn at all times during the event and will be needed to load buses. Security may ask to show your wristband while in the park. Only those with a wristband will be allowed to stay for the laser show. If you are planning on walking in through the Canyon Rim Trail, please check in prior to event day at the Southern Idaho Tourism office located next door to the Twin Falls Visitors Center to receive your wristband. Main parking will be available at the River Christian Fellowship Church located at 4002 N 3300 E, Twin Falls, ID 83301. Overflow parking will also be available at Pillar Falls Elementary School located at 3105 Stadium Blvd, Twin Falls, Idaho 83301. Volunteers will direct you to the best place to park. Absolutely no parking will be permitted in the park after hours. Unauthorized cars parked in the canyon after hours will be towed at the owner’s expense. Buses will transport guests from the parking lots to the main Shoshone Falls Park. All passengers must purchase a ticket and be wearing a wristband to load buses. Buses will start loading guests at 6:30pm each night and run continuously. The buses will STOP running at 9:30pm. Please arrive no later than 9pm to find parking and load the bus. Buses will be ready to take guests back to the main and overflow parking lots immediately after the show. Each bus will be marked based on which parking lot your car is parked. Guests are allowed to walk to the park and show on the canyon rim trail ONLY. Be aware the path is very dark after the show and flashlights are necessary. What will the show be like? Show length is between 20-25 minutes long. The lasers will project on the canyon walls and falls. Small bleachers will be lined up along the railings for people to see, but people are welcome to bring blankets or find places to stand. The show starts at 10pm. It will be an all new show celebrating the beautiful river and the valley. New elements have been added including a narrated story line, curated graphics and great music. Dogs may be walked into the park along the Canyon Rim Trail, but are not allowed on the transportation buses. Only service animals are allowed on buses. Yes! A designated wheelchair area is on site with a spectacular viewing area. Handicap parking, as well as all parking, will be located at the River Christian Fellowship Church. Buses will be wheelchair accessible. No vehicles are allowed to park in the Shoshone Falls parking lot per park policy since the event occurs after dark. Please reach out to us at [email protected] once your ticket has been purchased and we will make sure to reserve a dedicated viewing spot for you. An information booth will be set up next to the park’s main concession stand. During the event, security and volunteers will be walking the park. No alcohol will be allowed in the park after hours. No outside food or drinks will be permitted on the bus without prior permission. Service animals are permitted on buses, all others must be walked in on the canyon rim trail. All guests must stay on the marked paths. Anyone caught off the canyon rim trail will be handed over to the Twin Falls Police. What does event revenue go towards? All proceeds will go towards promoting and developing the beautiful Magic Valley. 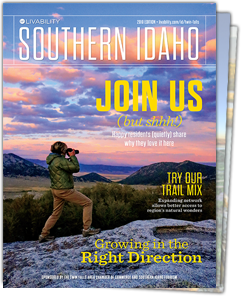 Southern Idaho Tourism is a regional 501c3 that has helped with developing parks, hosting trash and graffiti clean ups, trail restoration, new recreational access, and much more. Our current focus is fixing Broken Bridge for pedestrian and bike access. This would connect Auger Falls Park to the Jerome Yingst Grade connecting miles of trails and communities. AWOL Adventure Sports operates a four line zip course that will take you racing at 45mph through the Snake River Canyon. Participants will experience an exhilarating ride while enjoying the natural beauty of the canyon. Come down and kayak 486′ below the Perrine Bridge or paddleboard to Shoshone Falls. Experience the Snake River Canyon in an exhilarating way! AWOL offers paddle sports rentals. Magic Valley’s first indoor Climbing and Fitness Facility! We have something for everyone, from first-time climbers and families to groups, to serious rock climbers. Our #1 goal is to provide a facility that any person can attend and have a great time. Putter’s Mini Golf is Idaho’s Premier miniature golf facility. We offer 19 unique, challenging and fun holes themed around Idaho. New facility with holes that are modeled off Shoshone Falls, Balanced Rock & More.